One old-fashioned toilet trick that still works to save money and energy is the old “brick-in-the-tank” trick. Though, instead of a brick, an updated tip that an article from the Mother Nature Network recommends is to fill an old one-liter plastic bottle partially with sand, marbles or pebbles, and then the rest of it with water. As long as the bottle remains weighed down, it doesn’t matter what material you fill it with. Remove the label and place the bottle in the toilet tank away from moving parts. This will displace water and save you water usage and money without replacing your toilet! Another option is to purchase a device that displaces the water for you at a consistent rate per flush. The Toilet Tummy, for example, is a bag that you fill with water and hang in your toilet tank. By doing so, your toilet saves 80 ounces of water per flush, or double if you use two. The gadget costs less than $6 too. Definitely worth the price, considering how much money it’ll save you in the long run! 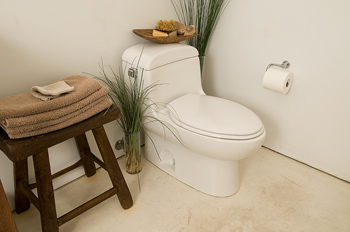 Leaking toilets are another issue that owners of old toilets have to deal with. A DIY test to see if your toilet tank is leaking is to place a colored dye in your tank and see if the color appears in your toilet bowl water. If it does, you can replace the rubber flappers that surround your tank for just a few bucks and save yourself oodles of wasted water. Just remember, there are always ways to save energy in your home without spending a ton of money on home improvements! When you do decide to upgrade your toilet, look for a toilet with a WaterSense label to ensure energy efficiency.